Effectively Separate Oil from Condensate.The FS-Curtis Clean Pro Series Oil Water Separators are designed to separate oil from condensate that is extracted from compressed air systems from 65 scfm through 1250 scfm. The polypropylene material in the Clean Pro Oil Water Separators has the perfect effect on oil-it attracts oil and captures it, almost as if it draws oil like a magnet. That simplicity and our technology are at the root of the FS-Curtis Clean Pro oil water separators efficiency to clean virtually all types of condensate, emulsified or not.The typical output oil residue value is less than 10 ppm. 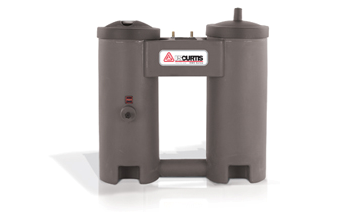 All FS-Curtis Clean Pro oil water separators can accept condensate discharge from intelligent drains, timer drains, float drains and manual drains. The efficiency of the OWS Series Clean Pro oil water separators means that it is not uncommon for the condensate to be clean enough for drain discharge even before it reaches the active carbon elements for final cleansing. The Clean Pro Oil Water Separators collect all the separated oil in a special disposable filter, which means that when the filter is changed, all the separated oil is removed from the system. The low size and weight of the Clean Pro Oil Water Separators means that they will fit almost anywhere and will take less time and manpower to position. The separator does not need a smooth or a very level floor or adjustment. It is not necessary to purchase and fit special, expensive drain valves.